My friend Carol's birthday celebration was last night at Rose's house. Everyone brought a salad. I love an excuse to buy the big Del Monte fruit salads from Costco. They are ordinarily too big for us. After cutting the huge chunks into smaller pieces, and adding some blueberries that I had on hand, I thought I might make a salad dressing. 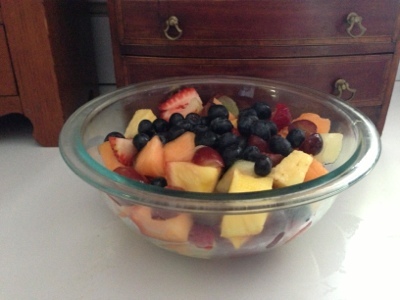 After googling fruit salad dressings, I found a site with recipes and comments about cream based dressings, honey based dressings, orange juice based dressings, mayonnaise based dressings and combinations of the above. Then, I read the forceful comments of someone who hates all fruit salad dressings. Really, really, really hates them. I don't like them either. 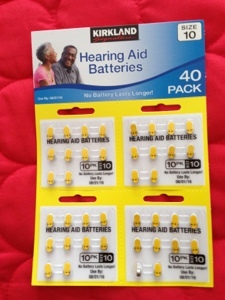 My Dad needed new hearing aid batteries but didn't want too many. 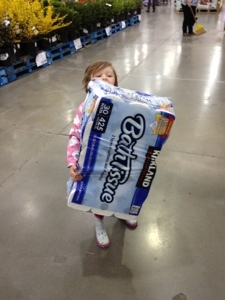 I insisted on checking at Costco. My Dad told me he used to pay about $1.00 each. These were $.25 cents each! I think the price convinced him even though we ended up with 40! 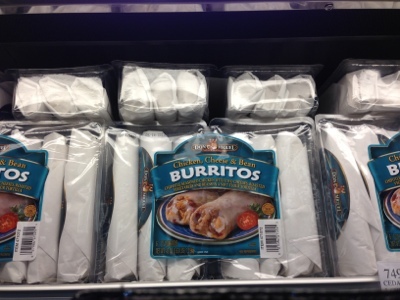 These Don Miguel Chicken, Cheese and Bean burritos in the Costco refrigerator cases back by the butchers are winners. The ingredients taste good, and, as my friend said, there's a lot of chicken. I usually freeze them as soon as I get home from the store. Last week when my friend came from Charlottesville, after a day of Nashville site touring, we were too tired to go out. I thawed these on defrost setting in the microwave (two minutes), then followed the regular baking instructions but added 5 minutes. Dinner in less than 30 minutes. I serve with salsa and avocado or tossed salad. Definitely need some veggies to go with. Going to the big national quilt show in Paducah, Kentucky so I'm thinking about Costco and crafts. Several years ago I bought craft scissors, hole punches in cute shapes (which were really fun with my three year old granddaughter) and other scrapbooking supplies at Costco. But those are no longer sold. Buy it when you see it! 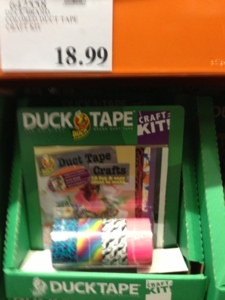 Right now, my Costco has a duck tape craft kit in office supplies - four rolls of patterned duct tape with an instruction book. 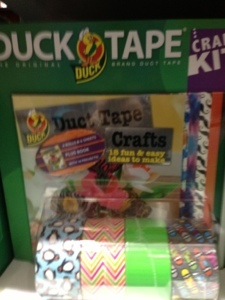 This looks like something that would be fun for someone, but probably not me. 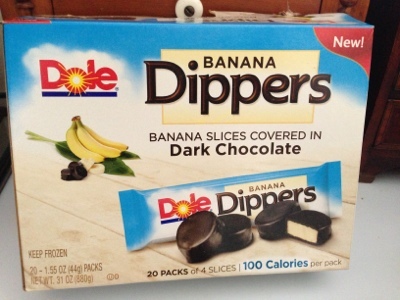 These Banana Dippers are a new product in West Nashville Costco's ice cream section. Each pack has four chocolate covered frozen banana slices - tasty, low calorie and fairly healthy. I've made a similar snack by dipping frozen bananas in melted chocolate chips. The store product is more consistent than my efforts, and bite sized, so easier to eat. Cut bananas into three inch lengths. Dip the frozen banana pieces in the chocolate. 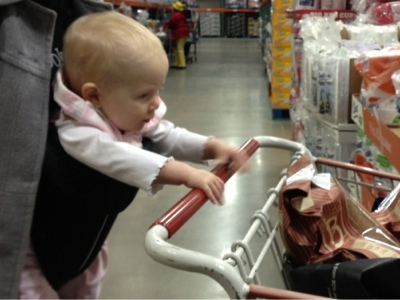 This has to be my favorite Costco blog! I can't tell exactly where she is, but according to Google translate, she's writing in Japanese about Japan Costco. Also, from Google translate, this is a hobby site not affiliated with Costco. All the products are unfamiliar to me. Previously, buy black vinegar into sauce sesame gold Mitsukan's, it has been used as a sesame of pan and dressing, the shape of the dressing I had been Mottari in mayonnaise like totally there, but the dressing of Kewpie I have a feeling Sarah Innovation with the thickening slightly. I love how this almost makes sense to me, may have something to do with (I think I might have mentioned) I lived in Japan for three years in the '50's. Maybe we could have a Costco bloggers convention! In Hawaii! Jeff Bauman, the man in the wheelchair in the now famous Boston Marathon bombing photo (the one with the man in a cowboy hat), is a Costco employee. CostcoToday twitter feed tweeted that Costco will match employee donations to the family's foundation. Other sources on twitter say $300,000 has been raised so far. Jeff Bauman has ordinary medical insurance through Costco, but every penny will help. Checking out at Costco today, I was behind a man with a cart loaded with all good things - everything I've always wanted at Costco but couldn't justify - black and white cookies, mini lemon cupcakes, tortilla chips, multiple cheeses, every type of berry. "What are you going to do with all of that?" He told me it's prom night and the after party is at his house. He is a little worried because he hasn't been given a count of how many kids to expect, but he is pretty sure that he won't run out of food. His bill - $360. Come along inside...we'll see if tea and buns can make the world a better place. 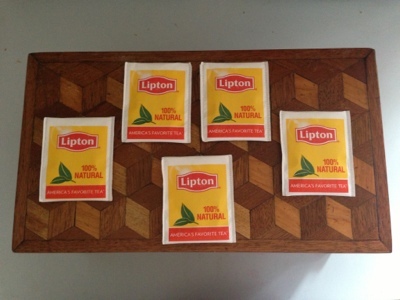 My favorite brand of tea is Lipton. And has been for 40 years. Decades ago I attempted to find a more elegant tea to prefer and tried to develop a taste for Earl Grey or lapsang souchong. I thought Tetley slightly more upscale than Lipton, and tried to convince myself to prefer that. Even though my heart is with Lipton, I want to try Mariage Freres black tea which, according to rumor, is truly wonderful. Can't find it in Nashville. Wouldn't it be great if Costco had a specialty tea package again? My ex-husband was an Englishman, and due to his influence, I switched from coffee to tea in the late '60s. Over the years, I've tried different methods of making the necessary hot water: whistling tea kettles, small coffee pots, microwaves. 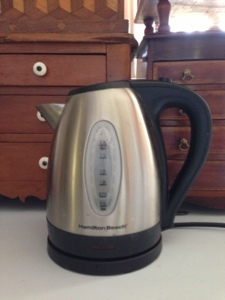 The very best was the instant hot water dispenser in my Brentwood house. The spray-nozzle hole in the sink was converted into an electrified hot water dispenser that worked as a hot water tap - hot water immediately, no waiting. That lasted a couple years until totally gunked up with the limestone residue so common in middle Tennessee water. My current, best solution is this electric tea kettle that turns itself off when ready and separates easily from the base for pouring. Purchased at Costco. I've been wanting this fancy colander at Costco but couldn't justify it to myself. Price was just too high. 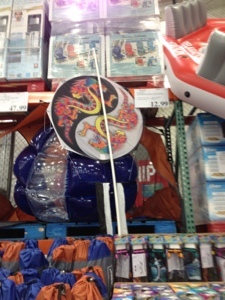 I was happy when I saw the price was reduced and changed to end in $.00 - the signal that Costco is selling off. 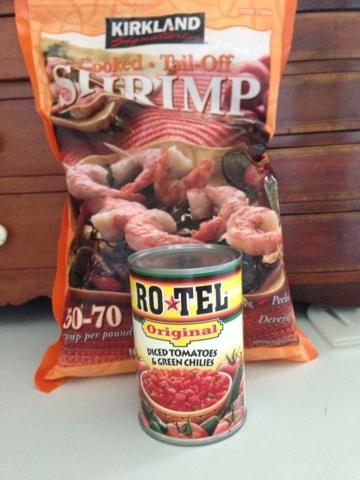 I will use it for pasta but also to unthaw fully cooked Kirkland frozen shrimp - a staple here (post to come). 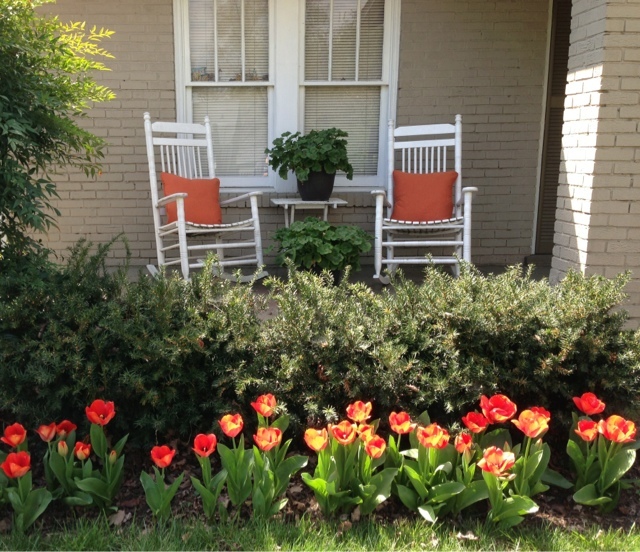 My front porch is making me happy; the Sunbrella cushions and geraniums are from Costco this spring. 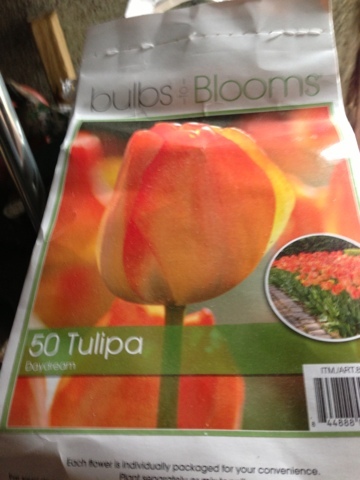 The tulips are from a bag of bulbs purchased at Costco last fall. The geraniums are three to a pot so I'm thinking about separating and planting those in the ground once the tulips are over. 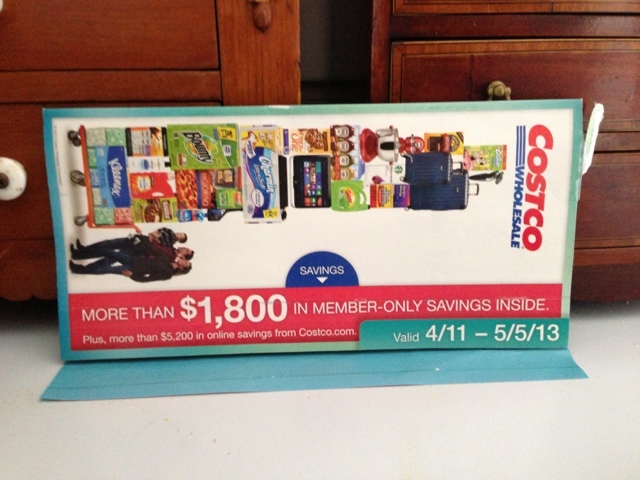 Below is a link to the new Costco coupon book posted by Kimberly at Addicted to Costco. Kimberly finds several things to like about the new coupon deals, I couldn't find much for me. I will take advantage of the coupon on Kirkland clothes detergent (I'll write more about my preference for that in another post). I might get the Perrier. If you need tires, might be a good time. Tires will be $70 off any set of 4 Bridgestone. I've been buying my replacement tires from Costco for years and have been very pleased. 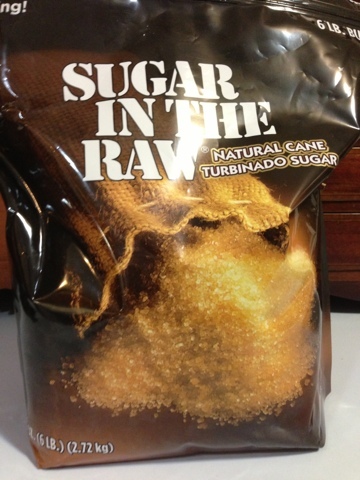 I was happy to see turbinado sugar in Costco. My ex-mother-in-law filled the sugar bowl with turbinado at Christmas; it always seems festive to me. 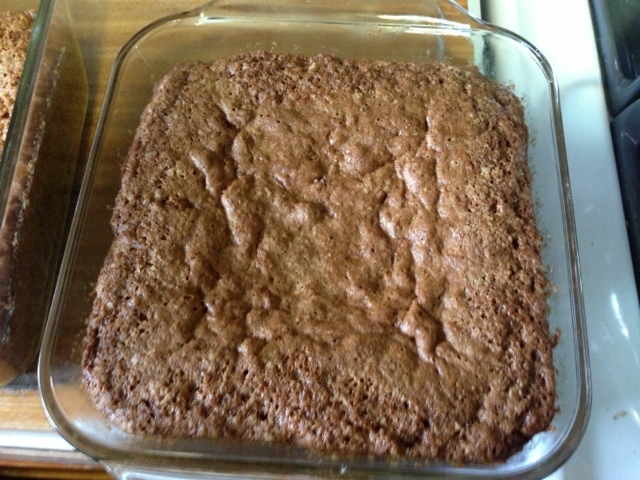 In cooking, the flavor is somewhere between white sugar and brown sugar. I'm pretty sure it improved the carrot cake. After Internet surfing about turbinado sugar, I understand that the liquid from the pressing of sugar cane is spun in a turbine to produce crystals - thus turbinado. At our house we hardly use any sugar. Even though I'll be using turbinado in place of white and brown, this will last a long long time. 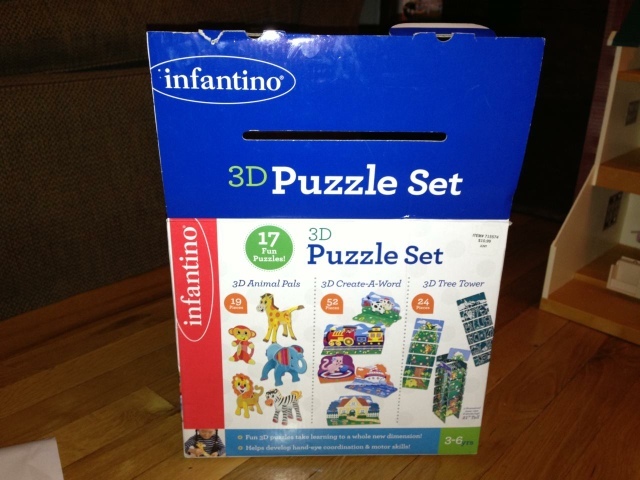 One of my three year old granddaughters likes this box of seventeen infantino puzzles found in the Costco book section. The direct quote from my daughter was "a big hit." As far as I can tell by looking on the Internet, the price was great. 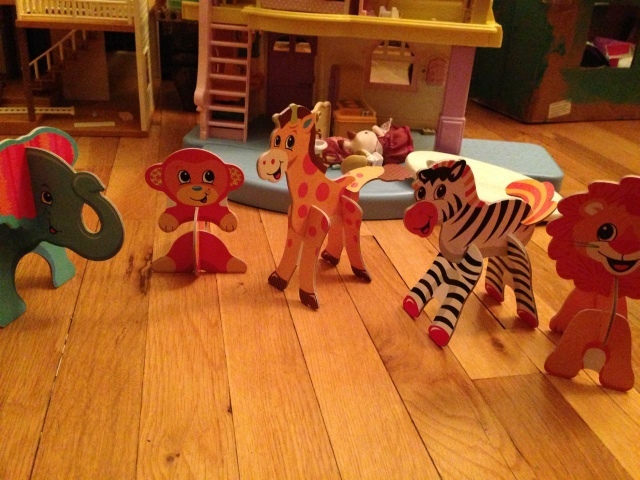 Of the two Costco infantino sets that I saw, one was for ages 1-3 and one for 3-6. I bought 3-6 although she's only a little older than three. 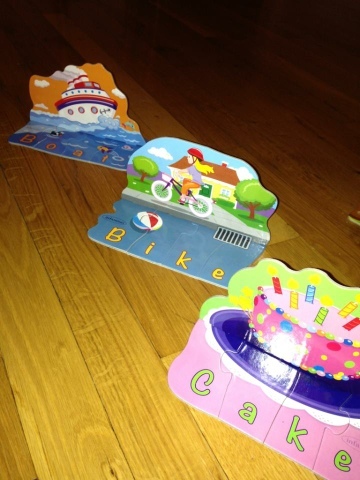 This child is a puzzle fan and these puzzles didn't look too difficult to me. Some people plan every facet of a trip, some people are delightfully spontaneous, and some people stumble into places not knowing where they are. Which is what happened to me when I found myself a member of Nashville Food Bloggers. Membership has three requirements, you have to live around Nashville, you have to have a blog, you have to have written about food. Check, check, check. They accepted me, so I randomly picked a couple members' blogs to read. Oops! These people are impressive cookbook authors and restaurant critics! I began to fantasize what it would take for me to up my game to a professional level - the massive amounts of carrots it would take to truly perfect the carrot cake recipe and not just say, "next time I would add less sugar." I could see my tiny kitchen overflowing with carrot cakes. For some reason I kept thinking of Lucy and Ethel in the chocolate shop. Always good to play with people better than you are. I guess. I admit to a challenge using the 800 million carrots I end up with when I buy carrots at Costco. My most recent attempt at a solution was carrot cake. I modified a standard carrot cake recipe found online. 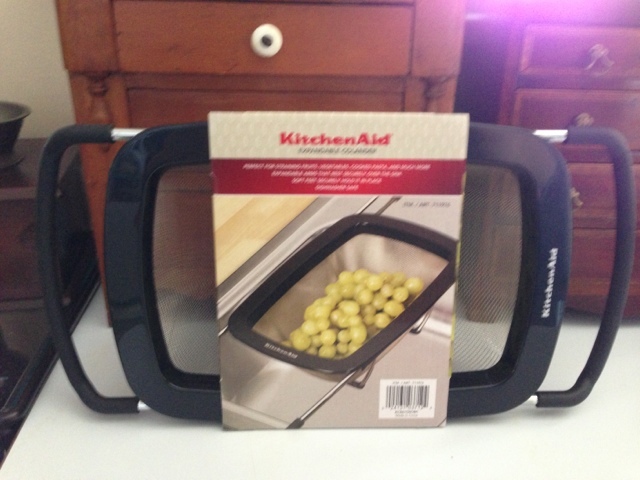 Put in one 9 x 9 pan and one loaf pan, a 9 by 13 pan would work. Cook at 350 until done, about 45 minutes. Pretty good. Next time I would try with 1/2 cup less sugar and 1/2 cup more raisins. 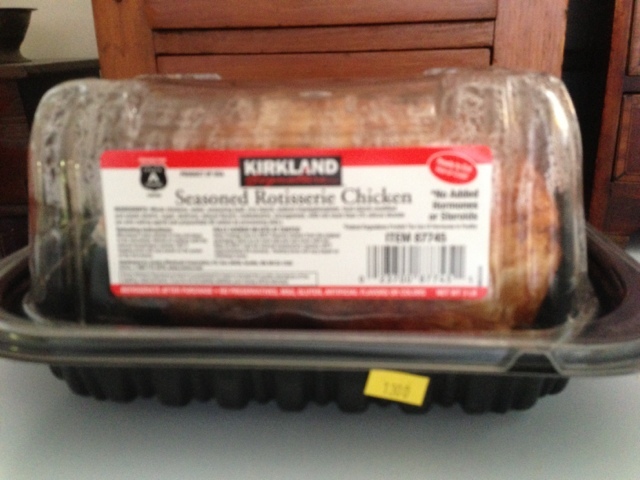 Costco has fabulous deals on roast chickens - fatter and cheaper than other stores. Only problem, choosing among 15 or so roast chickens. Several years ago I decided I was wasting valuable minutes of my life trying to choose the best roast chicken. So I made a decision. I always choose the chicken on the right. This is my guilty secret and I would appreciate it if you don't tell anyone. Tutu dresses are a phenomenon new to me. I'm pretty sure these are part of the current princess meme (again, maybe I mean trope). These dresses fall somewhere between a t-shirt and ball gown - stretchy, pulled over the head, but embellished by chiffon and lace. With a sufficiently gullible three year old, a granny could claim one of these is a princess costume. And a sufficiently unscrupulous granny could even claim the costume is that of a certain Arabian princess that wears blue. 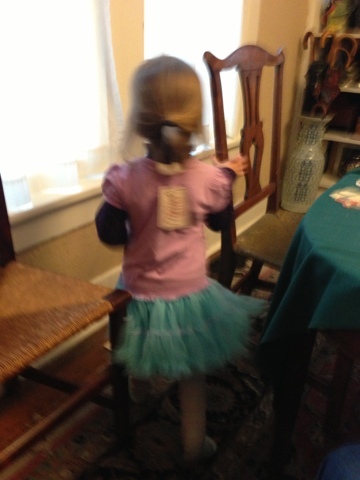 Here's a photo of the back of said tutu dress in motion. 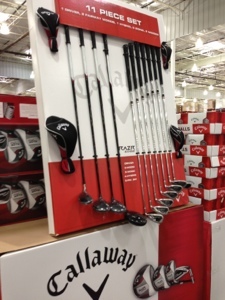 From Costco, price was right. I went out to dinner last night to celebrate birthdays of two women friends. Now, I'm so old that insulting cards aren't funny to me any more. I've switched back to the nice, pretty, innocuous ones. Costco usually has beautiful handmade cards. 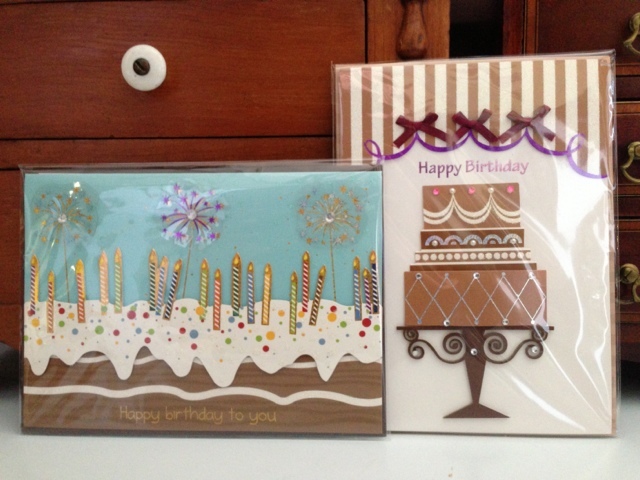 The ones in the photo are by Burgoyne; I don't think you can see the detail but the cards are three dimensional. 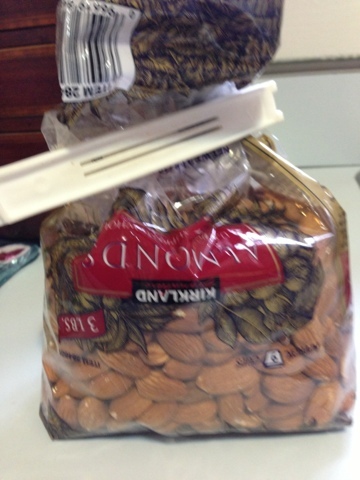 I'm worried about almonds. I've mentioned my reliance on almond butter but haven't mentioned my complete reliance on Costco raw almonds as a snack. The reason I'm worried is the potentially devastating disease that's ravaging bee colonies. Apparently, lack of bees is particularly devastating for almonds which rely on bee pollination. Here's a link to the NYT article.